At least, not yet. New York has an estimated 2 million of the creatures. Experts estimate all cities have about two rats per person. A recent story by Nashville’s Fox News had Nashville ranked as the 43rd most rat-infested city in the United States, according to a study conducted by Orkin, the pest control people. Bloomberg News cited statistics from the American Housing survey that ranked only the top 20 ratty cities, with Memphis was at No. 10. The late Francis Guest, a community leader and a man who frequented restaurants in the Loew’s Vanderbilt Hotel, often spoke of a rat invasion that occurred when Vanderbilt University razed several old dormitories on the corner of West End Avenue and 21st Avenue South. Mr. Guess claims the explosions and subsequent implosions displaced thousands of rats that chose to run across West End Avenue in search of a new den. Several waiters at the establishment confirmed his report, but quickly added that the event was several years ago, the rats had been exterminated quickly and that there had been no rat sightings in years. These vicious vermin are non-venomous, but deadly nonetheless as their bites could cause leptospirosis, a disease that can damage the liver or kidney of an infected human. Additionally, their saliva and urine can spread the virus known as lymphocytic choriomeningitis. In the Middle Ages, the Black Plague was attributed to rats, although more recent studies have blamed fleas and body lice. In short, as cute as the character Remy is in the movie “Ratatouille,” his friends and relatives can be deadly. One frightful and staggering concern comes from the Merck Veterinary manual stating that rats reach sexual maturity in four to five weeks and that their gestation period is only 21-23 days with each litter yielding six to 12 ratlings each. These rats are totally weened at the age of 21 days and on their own to terrorize the community. There are a number of warning signs that homeowners should learn as they seek to protect their environs. The sound of something scurrying behind the plaster or drywall in most cases is not paranormal type activity and usually not a cute misguided squirrel. They are rats in search of the food of the homeowner. A musky scent could be rat related if the home appears to be free of moisture. The Terminix website offers a subtle clue that could spell rat infestation, that being the discovery of dead rats. As has been noted, termites are omnipresent in this area and the rodent population is on the rise. One reason for this influx is the proliferation of dumpsters and garbage bins. With the population booming, there has been an exponential increase in restaurants and the inventory in these restaurants is leaning towards the “fresh” side with more farm to table opportunities. These fresh fruits, fish, and vegetables have lifespans shorter than the gestation period of rats and are discarded after a few days. Tons of rotting produce transforms into a gastronomic beacon for hungry mice and rats. For years, Nashville has provided the perfect breeding ground for termites, and all houses should be treated for termites lest they fall victim to the gluttonous mites. Mice and rats can be treated by the same companies, but they only treat if alerted by the homeowner. The Monteagle Sunday School Assembly has been a popular summertime gathering place for Nashvillians since its inception, and with thousands of Sewanee graduates within a hundred miles, the Monteagle and Sewanee communities are loaded with vacation homes owned by Nashvillians. As several locals have learned, they can enjoy the trees, shade and serenity of the Mountain with all of the conveniences of Nashville across Highway 100 from Percy Warner Park in the Harpeth Trace development. The peacefulness with no drive – and sales at $165 per square foot – are hard to pass up. Additionally, at least in past years, it could be debated Nashville’s NFL and SEC football teams were superior to Sewanee’s squad, but this year the pendulum has swung. Sewanee’s new football coach has the Tigers playing competitively and is aware of the obscure rule that after four downs without a score or a first down, he must surrender the ball. 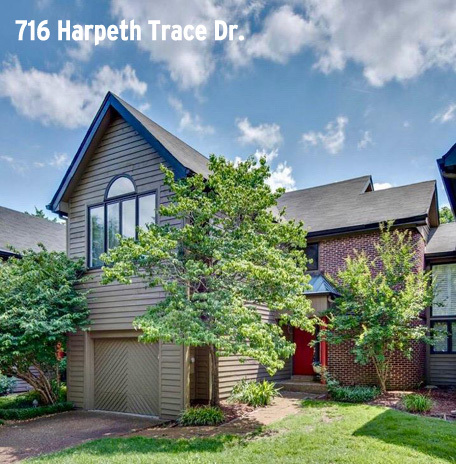 Back to Harpeth Trace, the house at 716 Harpeth Trace Drive, which sold recently for $234,000, has 1,513 square feet with two bedrooms, two full bathrooms and one half bath in a wide-open floor plan with a mightily vaulted ceiling. Bianca Tinsley, the baroness of Keller Williams Realty in Murfreesboro, was aptly chosen to list the home and sold it in a mere seven days. James Gary Wynn, as Realtracs knows him, is from Exit Realty Diversified represented the seller, who can dwell among the treetops and commune with nature.